WiFi in hotels is nothing new. According to statistics, 94% of people consider WiFi to be one of the most important attributes of a hotel, and as much as 38% consider lack of WiFi unacceptable and is willing to make a reservation in a different hotel. Hoteliers who go with the times realise that WiFi can not only be an asset to the Guests, but also to themselves. The owners of Hotel Bania**** Thermal & Ski know it very well - that’s why they decided to use Social WiFi. 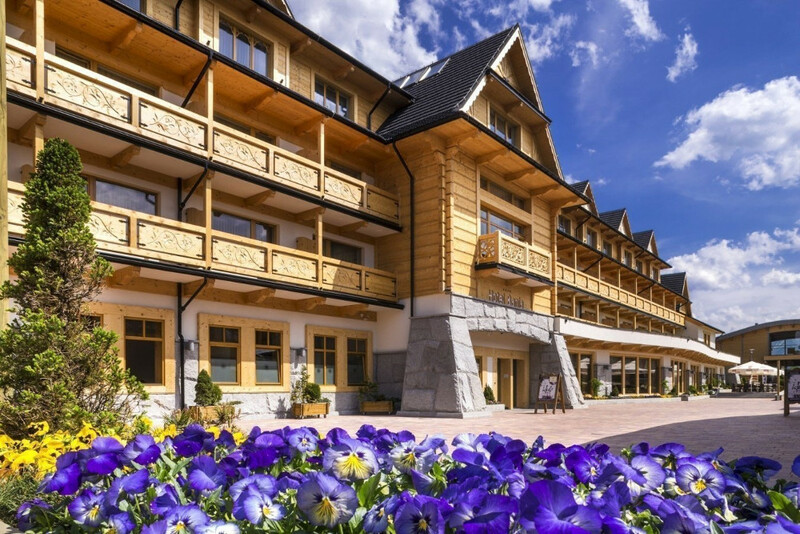 Hotel Bania**** Thermal & Ski is situated in Tatra Mountains, at the foot of the largest ski resort in Poland. The hotel features thermal pools and a ski resorts, all complete with a typical mountain atmosphere. It contains 156 rooms, a bar, a restaurant and a club. The infrastructure of the hotel and the surrounding areas has been meticulously prepared to suit the needs of even the most demanding Guests. The hotel exit leads directly to dedicated ski slopes and rentals, a ski school and a special winter area for children. The Bania Hotel is well suited for families, but it is also a great place for organising business meetings, company integration events and conferences. The hotel is connected to thermal pools of Terma Bania, which contains its own sanatorium and has a rich SPA offer. Social WiFi transforms a normal WiFi network into a modern marketing analytics service. It allows to e.g. display communicates in real time, send mass mailings and gather opinions through a five-star rating system. The service is frequently used in HoReCa and retail sectors as well as during indoor-outdoor events. The platform is integrated with SALESmanago, FreshMail, TripAdvisor, Facebook and Profitroom. Hotel Bania**** Thermal & Ski has been using Social WiFi since April 2016. After two and a half months the service has proven very beneficial - so far 7200 people have logged in to WiFi. Over 7200 people logged into the network during 2,5 month of Social WiFi’s use in Hotel Bania. All data is gathered in a dashboard to which the owners, managers or chosen employees can receive access. In Hotel Bania, 70% of people logged in with an email address, while 30% used social media. Thanks to utilising smart WiFi, the hotel’s owners managed to gather over 5000 emails. It is a considerable amount, especially given such a short time (ca. 2900 email addresses per month). The owners know exactly how many of the people who log in come back to the venue. Identification of returning customers might become the basis of rewarding them as part of a loyalty programme. Social WiFi also gathers data about the demographic background of people logging in, what can be particularly useful while conducting mailings. After logging into the WiFi, the Guest’s screen will display a splash page. At this point the Guests can easily call the hotel’s reception desk or like its Facebook page with one click. Additionally, the managers with access to the dashboard can put up any sort of content on the page, ranging from text to YouTube videos. Hotel Bania’s owners, for example, include information about the hotel’s offer, e.g. the restaurants, clubs and shops situated in or nearby the hotel. Studies show that 54% of hotel Guests search for offers and attractions nearby, leading Social WiFi to introduce welcome emails. Every Guest who logs into the WiFi in Hotel Bania will receive one the very moment they log into the network. This way the owners personally greet every Guest and present the agenda of attractions for the whole week. In the summertime, those attractions include film nights, competitions and events for children, parties and bonfires. Thanks to this every Guest has the agenda at hand and can access it anytime. The email address of every Guest who logs into the WiFi appears in the mailing database of the hotel. Over 2,5 months, the hotel has collected around 5000 email addresses. It is a massive number, especially since some of the people have already visited the object. That means we can be certain that they belong to our target audience. It causes a significant increases open rates, making it much more valuable than using a database gathered from a newsletter or a purchased from an outside agency. After connecting to the internet at Hotel Bania and accessing the WiFi, a browser popup will appear. The person then receives cookies, even before logging into Social WiFi. Using them allows the hotel’s owners to display ads to the users while they browse various internet websites - even after they leave the venue. This makes it possible for him to remind his clients about the hotel in a non-intrusive way and encourage them to come back. Social WiFi has an integrated satisfaction rating system, or “star rating” system. After leaving Hotel Bania, each of the Guests will receive an email asking them to rate their satisfaction with their visit on a scale of 1 to 5 stars. They can also leave their personal, written opinion. During 2,5 months, over 620 people have rated Hotel Bania, with 160 of them leaving their written response. The star system allows to gather a large number of trustworthy opinions - the people surveyed are not in any way rewarded or pressured to express their opinion. Such a method is therefore much more effective than traditional phone surveys or internet polls. An additional benefit of the star system is integration with the opinion-making portal TripAdvisor. 2 days after leaving a rating, the Guests of Hotel Bania receive an email encouraging them to also leave an opinion on TripAdvisor. Due to this integration, the amount of ratings on TripAdvisor increases, positively impacting the hotel’s image among the internet users, building up its trustworthiness and increasing its rating. “For us, the most important functionalities of Social WiFi are the star rating system and integrations with TripAdvisor and Freshmail. In a simple way we encourage our Guests to give their opinion on the portal which is important for us in terms of image. Moreover, thanks to Social WiFi everything is automated, which is very important with such large amounts of data. This allows us to better get to know the expectations of our Guests and develop in the proper direction”, explains Wojciech Sadowicz. Profitroom is the official distributor of the service on Polish hotel market.